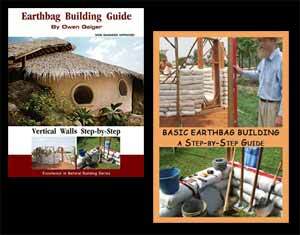 Enviro Earthbag Dome An ideal starter home, this plan is easy to extend or even create large dome clusters. Compact, but highly livable, the Enviro Dome has everything you need. Two lofts add 235 sq.ft. extra space for sleeping, home office, living or storage. The enviro dome is perfect for the beginner do-it-yourselfer who wants to build their own eco-friendly home at the lowest possible cost. The Enviro Dome 2 is the same plan as above, except there is a second bedroom dome and closet added on the right. Compact, but highly livable, the Enviro Dome 2 has three lofts with extra space for sleeping, home office, living or storage. Anyone can build this simple Peace Dome which contains all of the necessities for habitation. In addition to the basics, you could incorporate solar hot water, greywater recycling, composting toilet (shown, although a flush toilet can be used) to further reduce your ecological footprint. There are hot/cold, wet/dry climate design options available. In this Roundhouse/Dome Cluster there is a 2-story roundhouse in the center with either domes or more roundhouses on the east and west. There is a possible third bedroom, game room or home office in the roundhouse loft, 2 baths, separated bedrooms, large walk-in closets, dining area next to the windows, and lots of south-facing doors and windows. How to Build a Small Earthbag Dome A free, step-by-step description of how a 14 foot diameter earthbag dome was created. This prototype dome could serve as a model for emergency shelters, cabins, studios, garden sheds, etc. It should work well in earthquake-prone areas and places subject to flooding, winds, and hurricanes. This description is presented in three parts. Like o ther tiny houses, Tinyville provides just the basics in a compact space. It is intended as a starter house for those with little or no building experience and very little money. This design joins a 13′ interior diameter main dome with loft and a 10′ interior diameter small dome, with a vaulted passageway. I am very interested in this form of housing. I am looking into buying land asap. I was intered in one of the Owen geiger floor plans. I was wondering when purchasing the floor plan. Does the floor plan have specifics for example how many earth bags should be used and stuff like that? or do I just purchase as a build? See Dream Green Homes for details of what’s included with the plans. Take-offs are not included. We have blog posts that explain how to calculate How Many Bags Does it Take? Best answer: buy a roll of raschel mesh from the lowest cost supplier in Canada. Thank you. I will send pics. I wasn’t sure if that address was still correct because I sent a message there requesting to purchase house plans a few months ago and never got a response. Thank you. My old yahoo address is no longer valid. The gmail is my new address. Is there an email address where I can send a photo? I was thinking about putting in a reinforcement from square iron tubing legs (2×2 filled with cement) and with an iron plate at the bottom and an iron trough at the top that we could pour cement into after it is in place so that it will conform to the bags that are sagging. Thanks. Our contact information is at the top of the page. Your proposed solution might work. Not sure how you will actually do the repair. I am building a house in Kenya, incorporating arches in doorways in the Roman shape using auto tires for the form. I am using local workers, who are learning well in spite of a weak teacher. I neglected to use barbed wire in one of the arches. Now that the earthbags have seasoned and settled, there is some “mushrooming”. Four bags in the middle of the arch are dropping and I am fearing the wall above will be damaged. I think I can engineer some way to shore up the arch. I have pictures I can send but I don’t think that is an option here. Do you have any suggestions? Can you tell me if shoring up the arch will solve the problem. It would be best to see a photo so I can better judge the situation. There are various ways of making arches. Plus, I’m not sure of the extent of the damage. It doesn’t sound good because arches are designed to lock together (get stronger) under a load. If they’re already slipping then that’s a bad sign. The greatest danger may be long, straight unsupported walls. Walls like this need extra support from post and beam, buttresses, etc. I will be very thankfull if you can provide Dome house plans.